Calais beautifully opened this colloquium by discussing causes of large earthquakes in Stable Continental Regions (SCR) and their challenges for seismic hazard assessment. SCR are widespread and can have large earthquakes, yet, seismicity is often temporal and earthquake locations are spatially unclear. Seismologists must allow themselves to think differently on SRC earthquakes than as they do on plate boundary seismicity as one deals with fossil strain releases and different rates of tectonic loading. A continuous challenge in SCR is to find ways to map these temporal variations and to focus on earthquake triggering processes. A red line through this colloquium was the clear message to understand and complete our national seismic databases/catalogues from historical sources and early instrumental and high density seismic networks (Kaiser, Grolimund, Renouard). Challenges here are the uniformisation of magnitude scales, the conversion to one magnitude scale from multi-sourced databases (e.g. Bangladesh, Azari Sisi), and understanding the history of data collection and network improvement (Grolimund, Wilkin). Database improvement occurs by translating and studying historical (Mäntyniemin, Knuts) and medieval (Alexandre) texts and converting them to macroseismic intensities. However, assigning macroseismic intensities to municipalities asks for a careful re-evaluation of the building vulnerability. Macroseismic intervention groups (e.g. Mayotte seismic swarm, Sira) as well as historians here face the problem how vulnerability of pre-damaged building should be separated from successive damage effects of recurrent earthquakes. Nevertheless, improvement and understanding macroseismic databases (Van Noten) remains crucial as magnitude estimates from historical events remain key in seismic hazard assessment (Provost, Beinersdorf). Štěpančíková), LiDAR and InSAR analyses (Baize, Reicherter), combined DEM and morphometric indices analyses (Gaidzik) or using a probabilistic approach (Vanneste). These modern techniques are needed to improve the input data of seismotectonic models (Reicherter). One particular challenge put forward by Ferrari (keynote) is to increase efforts to investigate fault creeping along active faults to better understand how creep affects the strain build-up in hazardous active regions (e.g. NAFZ, EAFZ, Turkey). In paleoseismology, lake sediment coring is more and more often used as a source to investigate fault slip and to extend seismic catalogues (Jomard, Kremer). But it is not only about geology, also the local people’s historical social memory does help us constraining information on past – long forgotten – events (e.g. height of tsunami flooding, Salazar). Archaeoseismology is a discipline in which earthquake evidence in the world’s patrimonial heritage is addressed by studying (ancient) building damage. This discipline can be studied in the classic way by following a protocol in an archaeoseismological survey (Kazmer). However, the question whether or not a structure is damage by an earthquake can also be tackled by integrating engineering seismology (Montabert) and discrete element modelling to virtually investigate if structures can withstand earthquake ground motions (Hinzen, keynote). Using state-of-the-art software helps the archaeoseismologist to quantify damage and exclude improbable earthquake scenarios. Dessales (keynote) continued beautifully by questioning if Roman builders developed earthquake-resistant structures? This question is tackled in the RECAP project in which an engineering database of ancient earthquake damage repairs is created from the unique Pompeï ‘laboratory’. Also the Inca’s at Machu Picchu (Audin) and prehispanic cultures (Garduño-Monroy) recurrently dealt with seismicity that has affected their build heritage. It is challenging but perhaps key to link an ancient population’s architectural skill, the heritage ‘earthquake memory’ and the local earthquake geology to improve the seismic risk assessment in intraplate deformation zones. Hinzen ended this topic by suggesting that archaeoseismology perhaps also can learn from 20th century lost places that were abandoned after complete earthquake destruction. Caves usually have a complex formation history evolving from a karstogenesis in a past tectonic regime to endokarst geometry modification (Quinif, Manchuel). In this discipline it is important to study the differences in tectonic regime during karstogenesis and endokarst (Szczygieł). New insights were recently gained by investigating the consequences of earthquakes on caves (e.g. Wroblewski). Relating speleothem- and rock fall damage to a potential seismic source is particularly challenging. However, the improvement of various dating techniques (e.g. U/Th, 210Pb, Pinti) and image software made it possible to date the base of a new speleothem growth on a collapsed block collapse and link this to earthquake source (Quinif, Verheyden). Stability of speleothems is tested in earthquake ground motion models to prove whether or not speleothem are seismically broken (Gribovszki, Garduño-Monroy). 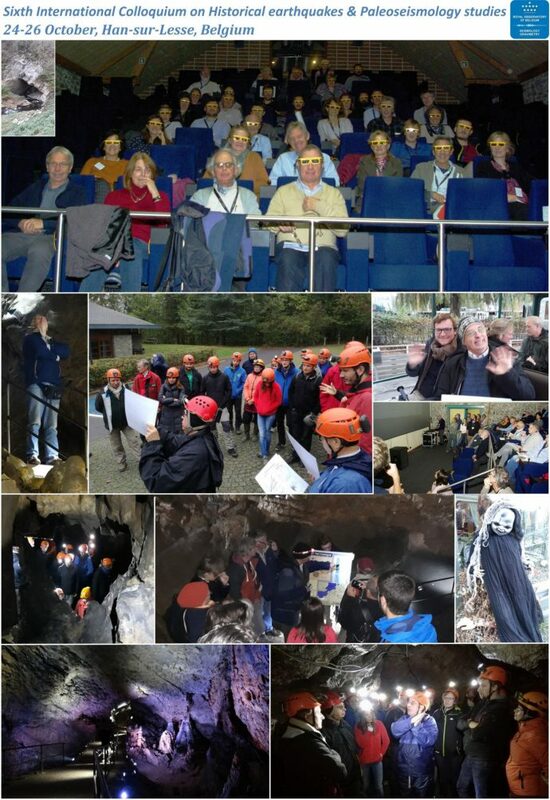 This last aspect nicely bridged the disciplines of engineering, archaeo- and cave seismology. We are already looking forward to next year’s edition in Barcelona organised by Christophe Sira and colleagues in Barcelona. You can also download the PDF of this report here.